Counsilman-Hunsaker, in association with the City of San Francisco Public Works Engineers, was commissioned to renovate and modernize the swimming pool at the existing Hamilton Recreation and Community Center in Pacific Heights, located in the central city area of San Francisco. The entire facility underwent a major modernization including renovation of locker rooms, natatorium and gymnasium facilities, and the installation of new outdoor children’s play structures for community use and childcare services. 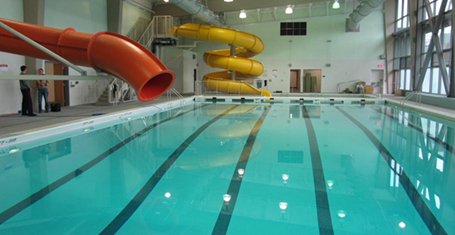 The extensive renovation of the swimming pool included waterproofing and refurbishing of the existing 40′ x 100′ pool tank, new circulation piping, filtration, and water treatment systems, the addition of two new waterslides and a shallow area bulkhead.